*This is a review of the Extended Version, or Special Edition, or Director's Cut, or whatever they call this. Nobody thought that J.R.R. Tolkien's beloved classic could ever make it to the big screen. That is, until Peter Jackson came along. Saving a hell of a lot of money on post-production while at the same time preserving realism, Jackson employed old-school photography techniques, such as forced perspective. This also makes you appreciate Peter Jackson's intense pre-production work and storyboarding. "You won't fit in the restroom. You can pee out back." The filmmakers also decided to retain the English-ness of Tolkien's work by making everyone speak in an English accent. Because, you know, Middle-Earth is a Caucasian continent, loosely based on the British isles. I think the strength of Peter Jackson's visuals lies in his framing and composition. Here are my two favorite shots of this film. Being invisible is like being on drugs. This first one is Strider swinging his torch or his sword at the Nazgûl (seriously, with an accent on the "u"), as seen through the eyes of an invisible Frodo, who is lying on the ground. This shot kind of reminds me of "The Last Supper". I don't know why, exactly. This second one is from the council meeting at Rivendell. You can see the turmoil of the council as they discuss the fate of the One Ring, reflected in─where else─the One Ring. Also, I'd like to say that Christopher Lee is a damn great actor. He wouldn't have one of Hollywood's lengthiest acting resumés if he wasn't great. Here, let me prove it to you by showing you this frame. 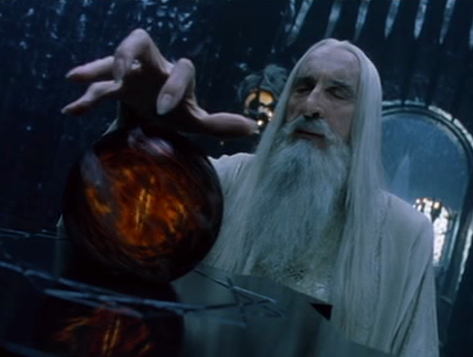 Now in the scene where this frame comes from, Saruman tries to read the contents of some magical crystal ball which they call a "palantír" (yes, seriously, with an accent on the "i"), loosely translated as a "seeing stone". In this shot, Saruman just holds his hand over the sphere, and is immediately able to access visions from afar. But check out how his fingers are held out─crooked, like an old hag or crone would. And that is where Christopher Lee's acting prowess steps in. Lee's acting is very energy-efficient. He can convey a lot of things by using very simple gestures. Like this one right here. By making his fingers crooked, he is able to convey to us two things: one, that Saruman is in deep concentration, showing us how powerful his mind is; and two, by sticking his fingers sticking out at funny angles, he is stirring in our imaginations images of evil witches who cast really powerful spells by holding out their crooked fingers in weird angles. And that, ladies and gentlemen, was the great Christopher Lee. I think this was the only time that all nine members of the Fellowship got together in a single frame. Okay, let us now analyze the casting. Using the group pic from above, let us move counter-clockwise from bottom left. Sean Astin (Samwise Gamgee): American; hence, fake accent. Elijah Wood (Frodo Baggins): Another American, also with a fake accent. Yet he has really expressive eyes. His eyes actually did half of his acting for him. Dominic Monaghan (Merry Brandybuck): His Hobbit wig hides his huge ears. Billy Boyd (Pippin Took): A real Briton. Love his accent. He was also in Master and Commander. John Rhys-Davies (Gimli): Despite being the tallest member of the Fellowship in real life, I could think of no other actor who could've played Gimli as well as he did. Sean Bean (Boromir): Great acting choice. Sean Bean may not be a household name, but he is one hell of an actor. Orlando Bloom (Legolas): In my opinion, Orlando Bloom was born to play only Legolas--nothing more. That's because he has only one style of acting. But that can change over time, as long as he remains dedicated to his craft. An example of this is Leonardo DiCaprio. I used to hate his acting, but he got better as he grew older. Ian McKellen (Gandalf): No other person could play Gandalf. McKellen is the best choice. Viggo Mortensen (Aragorn): Despite being an American (hence, a fake accent), Mortensen totally pulled it off. But his brilliance as Aragorn was also his downfall. Now, no matter how many movies he makes after Lord of the Rings, people will always remember him as Aragorn. So that's that. Nine males. Where are the females, you ask? Is Middle-Earth like a veritable sausage fest? No, it's not. 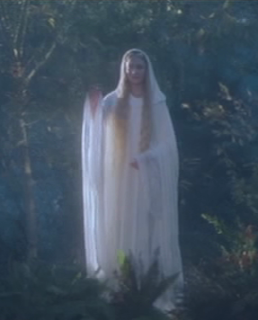 There's the beautiful Cate Blanchett as Galadriel. But dressing her up like the Virgin Mary should be enough to kill any sexual desire that Liv Tyler's face may have brought up. "Chastity and celibacy, my dear Hobbits." Okay, some of you smart asses might be asking, "But what's the difference between this special extended version and the original theatrical release?" Well that's pretty obvious, isn't it? Deleted scenes. There's a lot of scenes here that were cut from the theatrical version. There's that first part in the Shire, concerning Hobbits. Then there's also that gift-giving scene between Galadriel and the Fellowship. But sorry, nerds, Tom Bombadil isn't in this version either. I guess that character will remain solely in the literary version. Lord of the Rings: The Fellowship of the Ring. USA/New Zealand. 2001. I'm sure you thought that too.